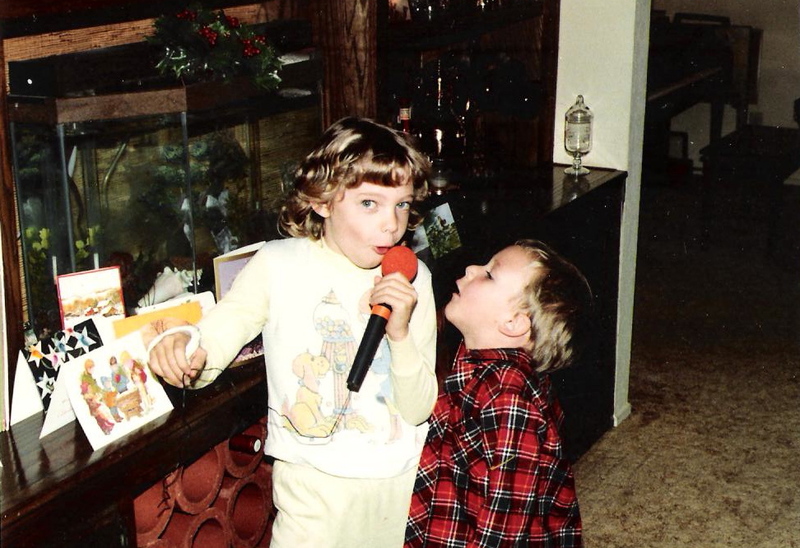 Growing up, my brother and I had a regular babysitter. Her name was Colette. Colette was a part of the family, the go-to gal for YEARS whenever my folks wanted a night out. And she was awesome. She’d let me watch MTV and stay up late, as long as I brushed her long, black hair. She let us take all of the cushions off of the massive couch and make forts- or, even better, take a running leap off of a small staircase onto them, Superman style. She’d hum along when Matt and I sang duets to her, Christmas carols or songs from church. We were a handful- but she let us be. My favorite was when she’d show me how to stretch properly before a full-on dance party to a Pat Benatar cassette tape in the living room. We’d prop our legs onto the back of a chair, loosening up before shaking our booties all around the house. I remember trying to copy her dancing and knowing I was getting it wrong, but Colette would shout, “NICE MOVES!” over the music, so I’d keep going. 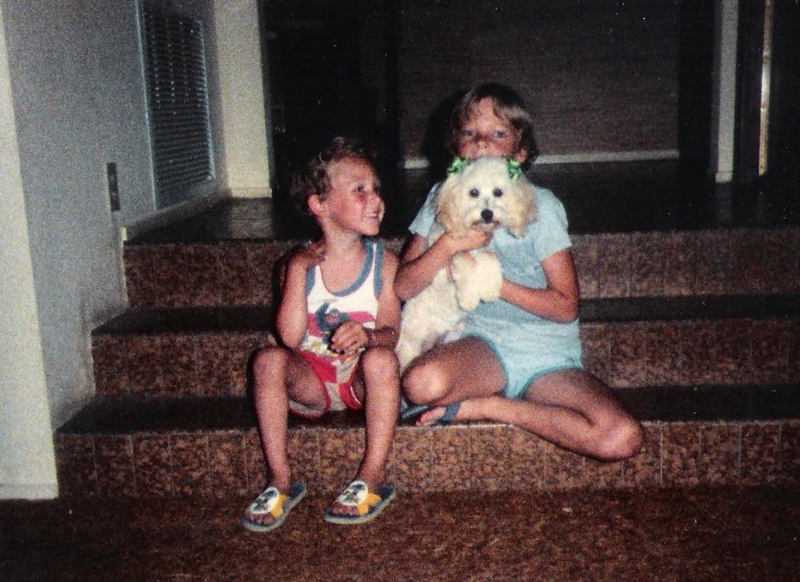 She always took great care of us, though it felt like playtime for us kids. She also had a couple of odd habits. She’d eat cereal with water when we were out of milk. And she had a favorite treat. She’d take a scoop of peanut butter, swirl chocolate syrup into it, pop it in the microwave, and eat it with a spoon. She LOVED it. I thought it was so weird. I made that simple gooey treat all through high school, even on days when I was the one babysitting Colette’s young daughter. 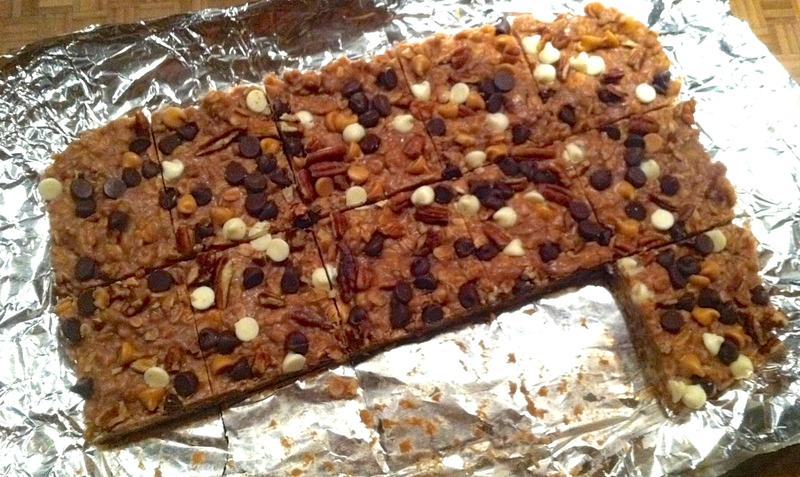 (I wonder if she watched me make it and thought, “She’s so weird.”) I made it in college, and my broke roommates thought it was a brilliant cure for a late-night sweet tooth. These bars remind me of that coffee cup full of melty peanut butter and chocolate. I was scanning my “sweet stuff” Pinterest board for a gluten-free treat of some kind and saw the words “chocolate” and “peanut butter” and… best of all… “no bake.” I didn’t want to spend a lot of time in the kitchen at 9pm at night. I wanted something sweet, quick and easy to make- without flour. A glance over the ingredient list showed that I had it all on hand. Forgive the lackluster photo quality- it was late, John was in the middle of making our dinner, and I was on a sweet-tooth mission. Into a bowl, I dumped a few cups of oatmeal, some peanut butter, and some vanilla. 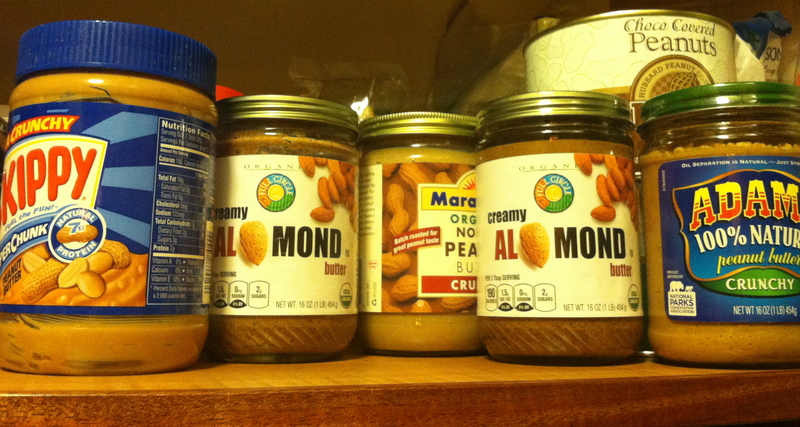 It was about this time that I realized we have a peanut/almond butter situation going on in the pantry, but I’d deal with that later. 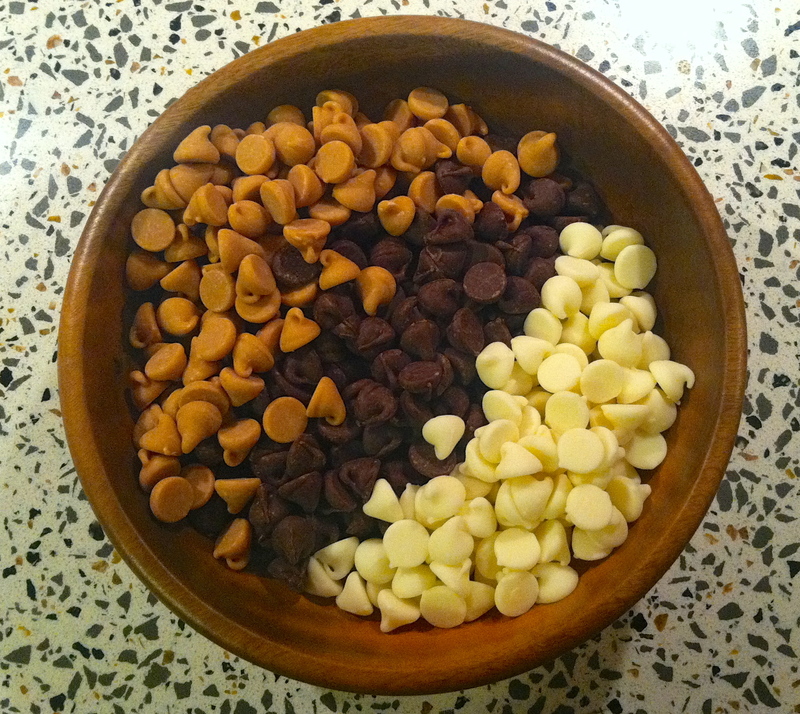 I added about a cup of chocolate chips (with some peanut butter and white chocolate chips thrown in for good measure). 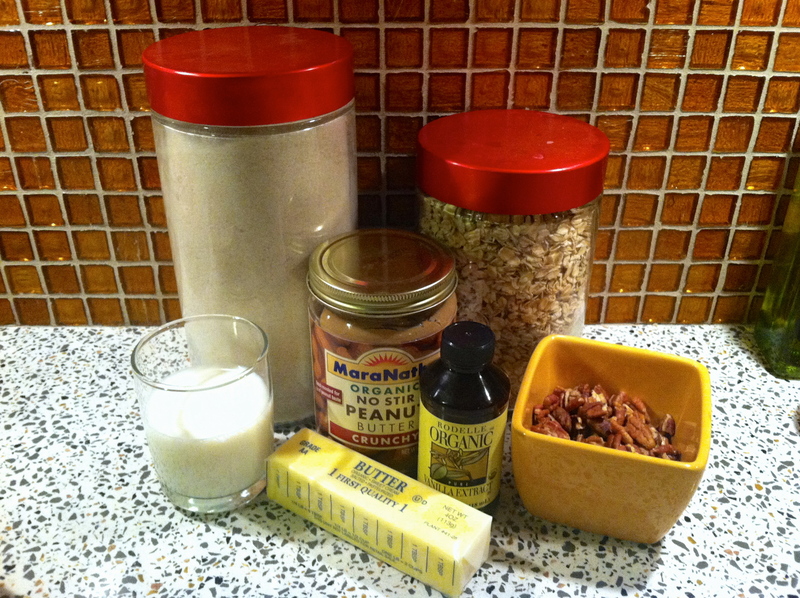 I decided to add some chopped pecans into the mix for an extra crunch and mixed away. My sore snowboard-fall arms screamed at me a little bit. 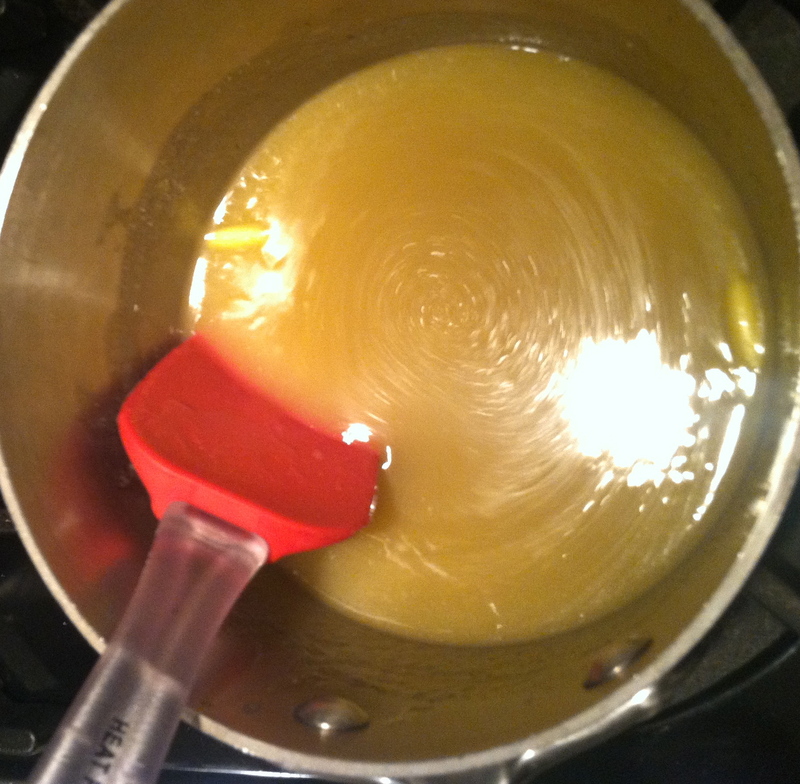 When the oats mixture was all combined, I simmered some butter, sugar, milk, and salt on the stove for a few minutes. The butter melted into the sugar and it became syrupy and amazing. 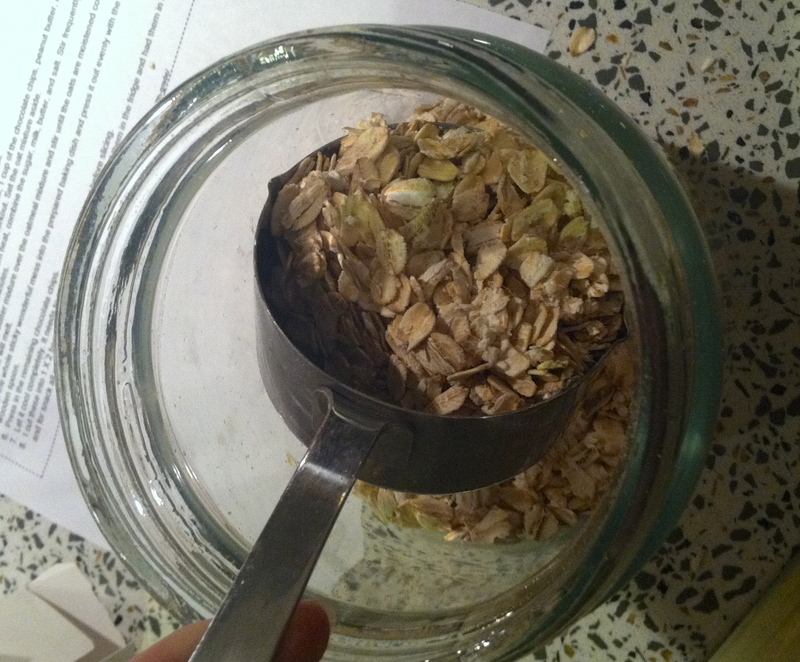 On a whim, I grabbed a little cinnamon sugar and gave the oats a few shakes. 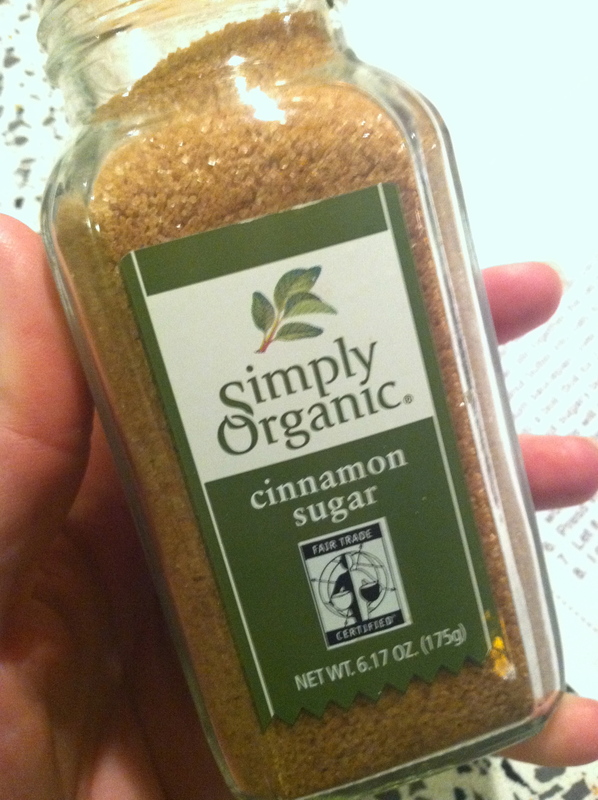 I love cinnamon, and these bars were already a big old hodge-podge of random. What could it hurt? 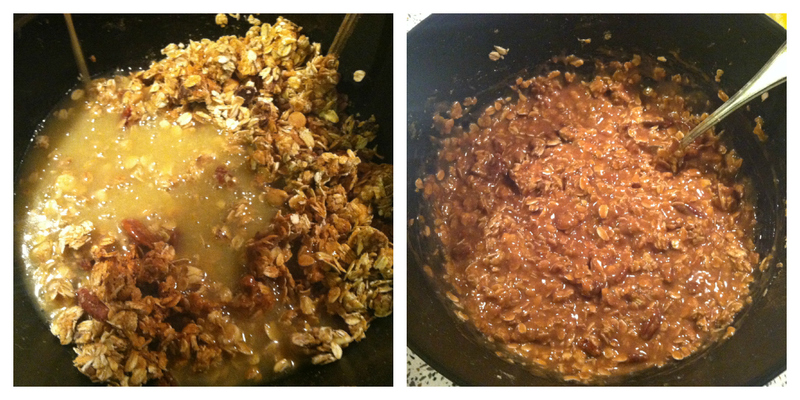 Into the oats went the buttery sweet syrup. 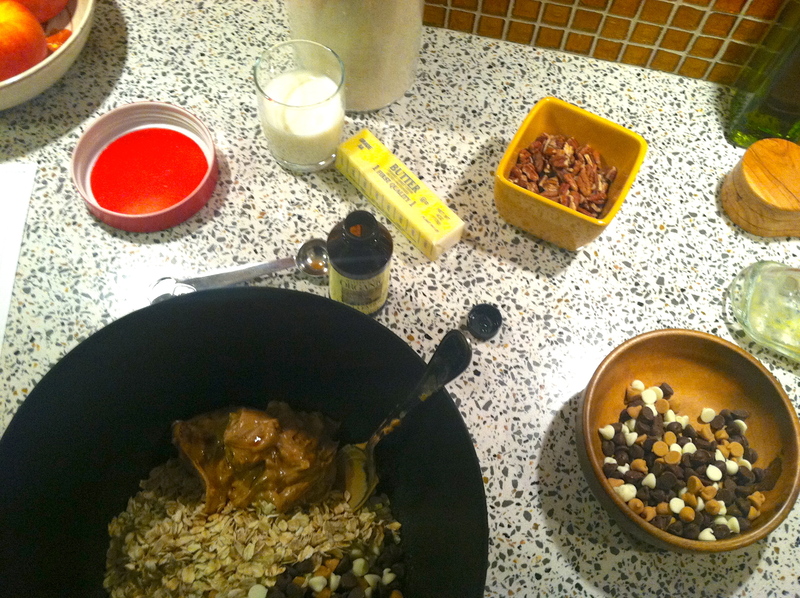 As I stirred the whole gooey mix together, the chocolate chips melted in with the peanut butter, coating the nuts and the oats. I had happy visions of Colette’s PB-Choco Coffee Cup. 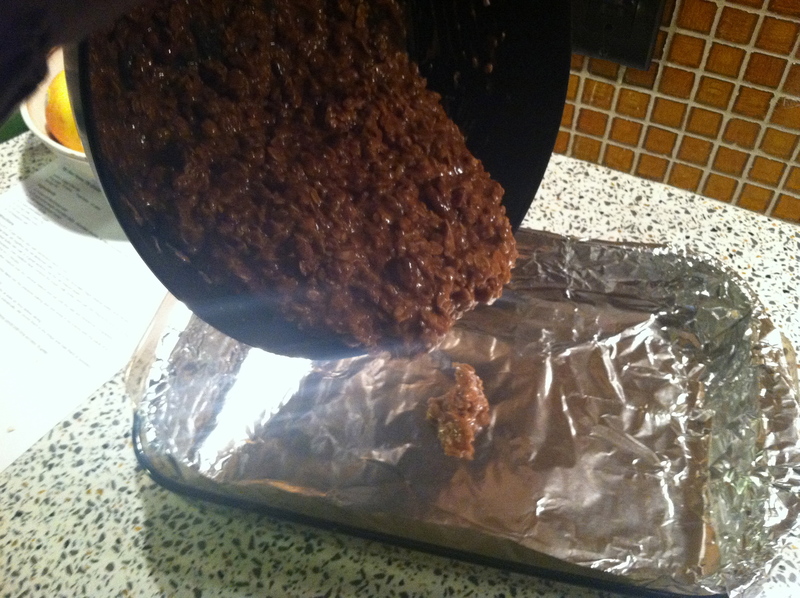 I poured the whole gloppy bowlful into a baking dish lined with aluminum foil and spread it out evenly. I took the remaining chocolate, peanut butter, and white chocolate chips and sprinkled them over the top, along with more chopped pecans. 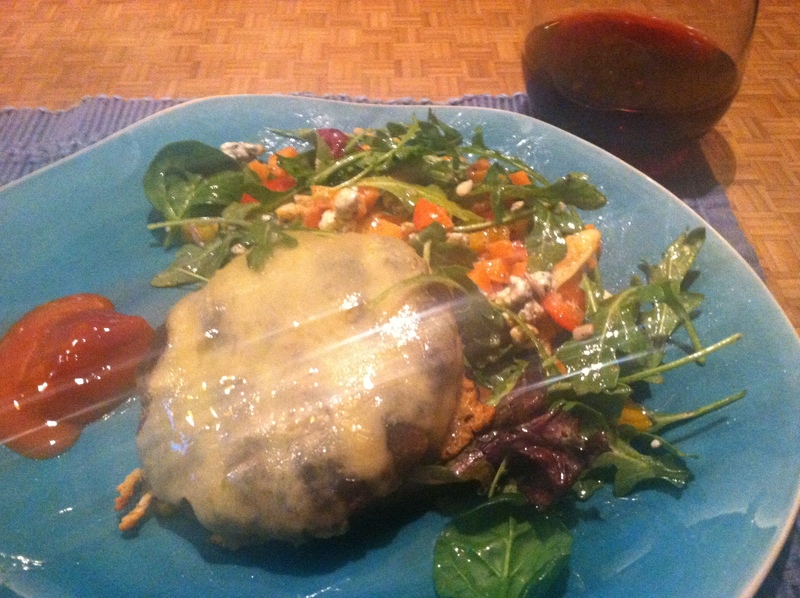 And then I set it aside, out of sight (and away from curious taste-testers named John) while we enjoyed a tasty turkey burger for dinner. After dinner, I felt myself fading for the day. I placed the baking dish of love into the fridge to speed up the setting process. In a half hour or so, it was time to slice- and taste. Guys, Colette was ahead of her time. The chocolate and peanut butter combo reminded me immediately of her weird/fab treat. 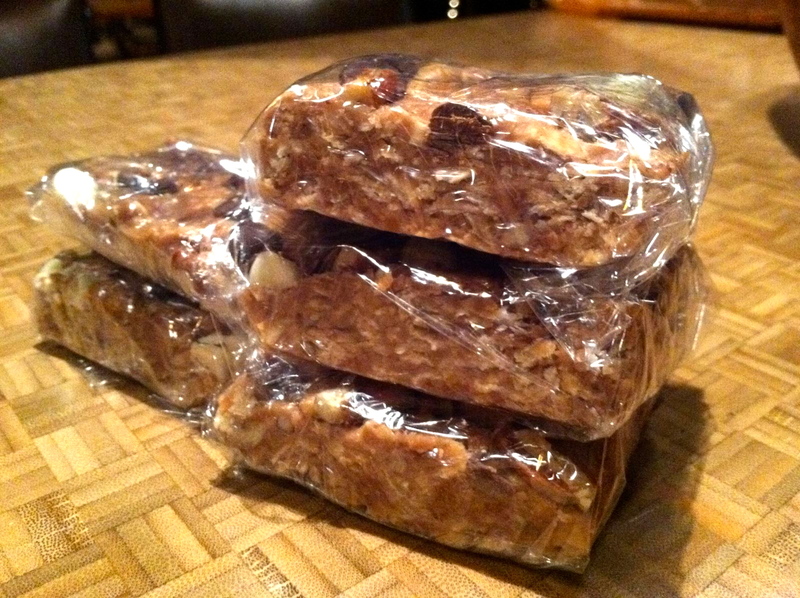 The consistency is almost like a piece of fudge, but the oatmeal and pecans gave the bars a chewy-crunchy texture. I think adding shredded coconut or even dried cranberries would be genius, too! Kitchen sink treats! A couple of bites was all I needed to get my sweetness fix, and John devoured his (he’s so easy to please with food!). Colette would love these bars. I wrapped up the rest of them individually for storage and shut off the lights. As I padded off to bed, a Pat Benatar song in my head, I wondered what Colette was up to now, all of these years later. Her daughter would be (gulp) in her 20s now, old enough to babysit or even care for her own child. I wondered if Colette’s long, raven-black hair had any gray in it. I wondered if she still danced around like a crazy woman to 80s music. And I wondered if she still had a thing for melted peanut butter and chocolate. Preferably in a coffee cup. 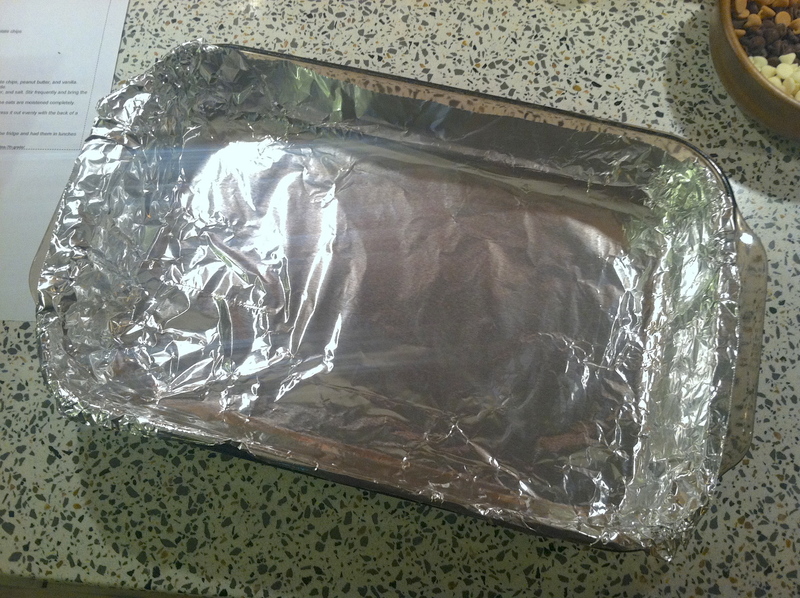 Line a 9×12 dish with aluminum foil. 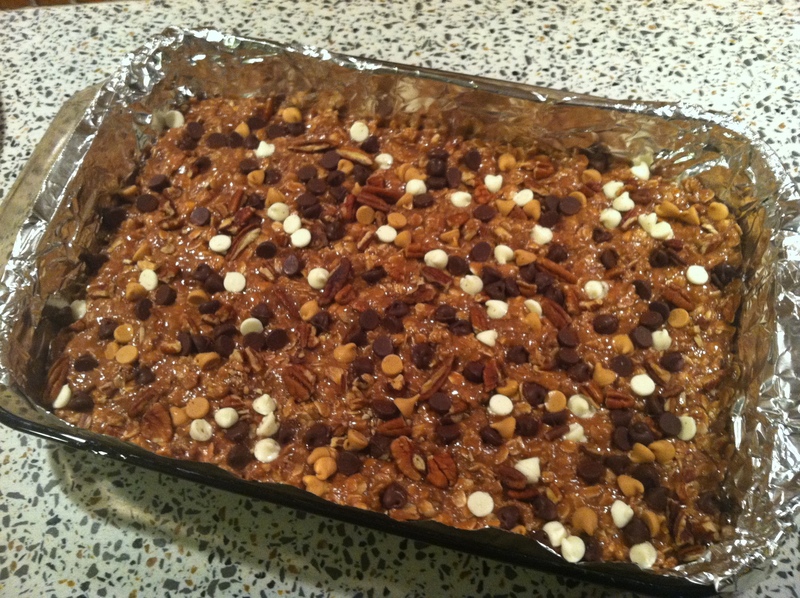 In a large bowl, stir the peanut butter, oats, vanilla, 1 cup mixed chocolate chips, and ½ cup chopped pecans. Set the bowl aside. 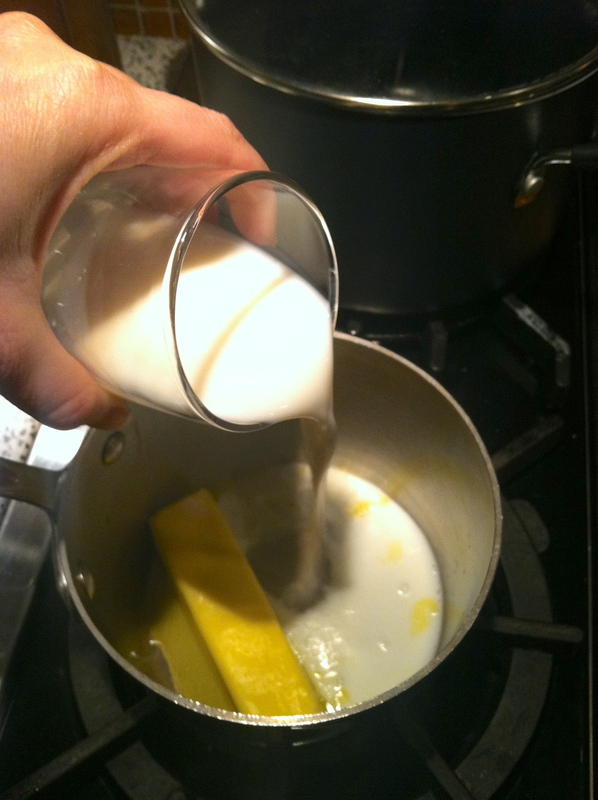 Over medium heat in a small saucepan, melt the stick of butter into the sugar, salt, and milk. 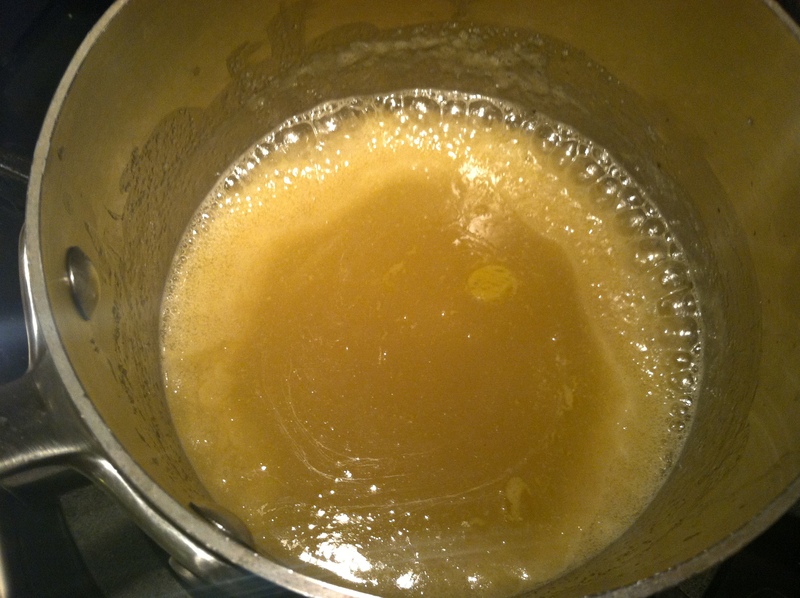 Stirring often, bring to a boil and let bubble for a couple of minutes. 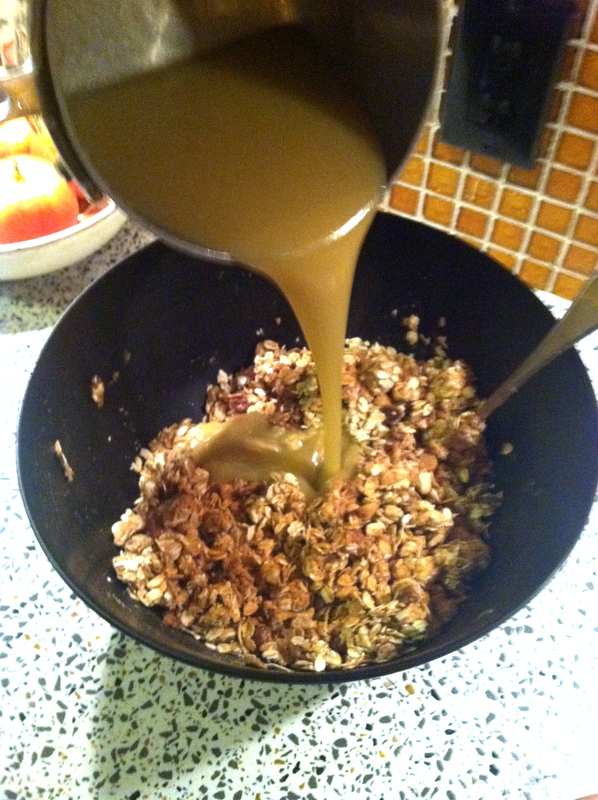 Pour the butter mixture into the oat mixture and stir well to combine. The chocolate chips will melt. 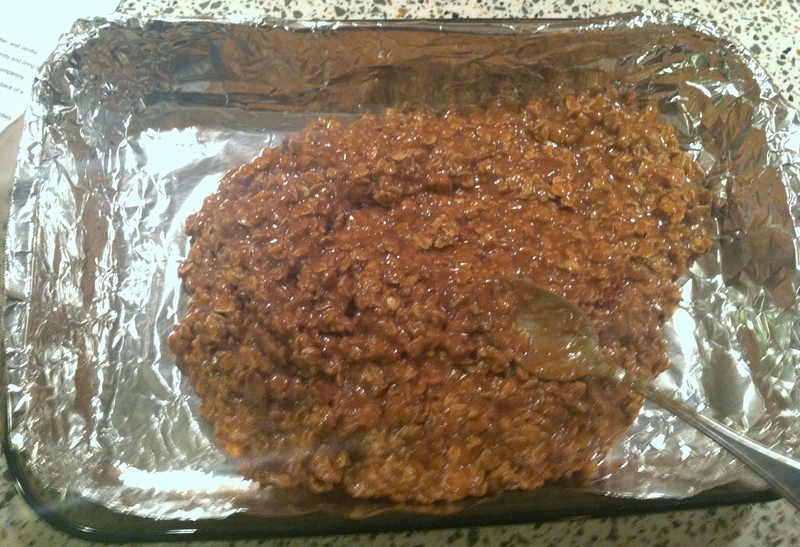 Dump the mixture into the prepared baking dish. 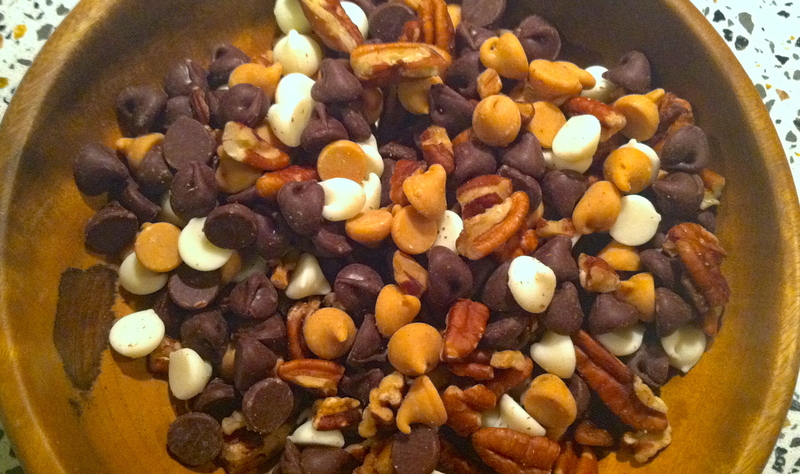 Spread it out evenly, then sprinkle the remaining chocolate chips and pecans over the top. Let set for an hour, or put it in the fridge for less time if you’re impatient like me. 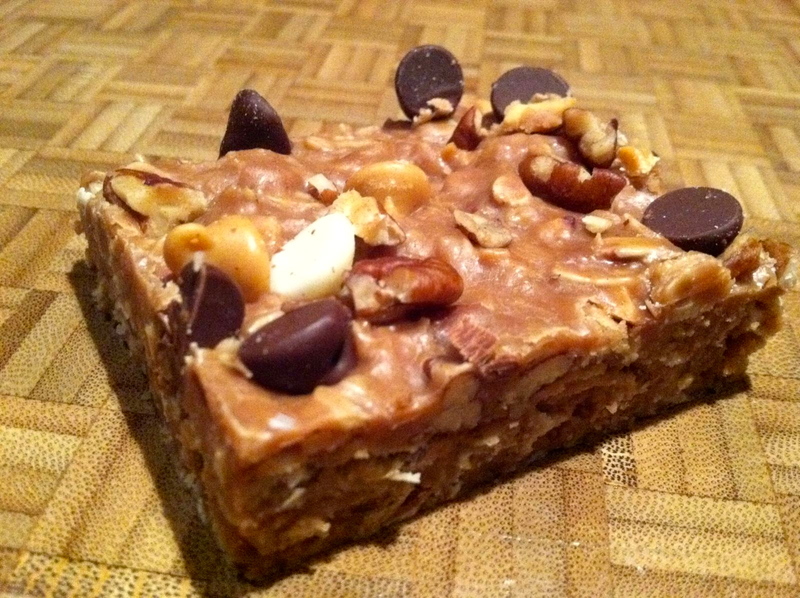 Slice into bars and enjoy while dancing to Pat Benatar or watching classic MTV. YUM! 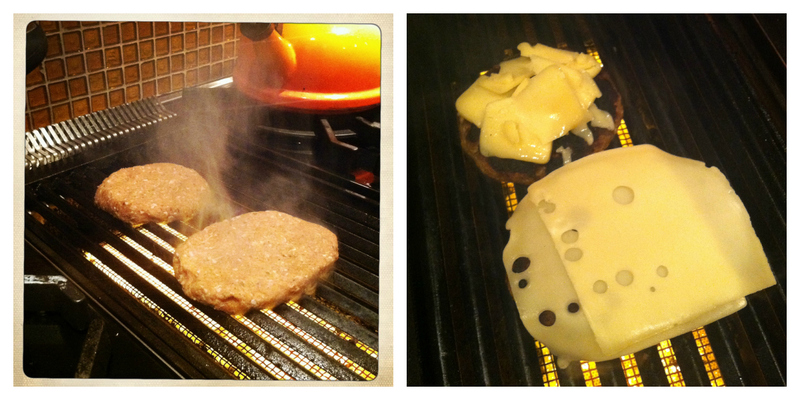 Find more recipes and culinary chaos on my Food Bliss page! Next postWhen a pizza-lover and “gluten-free” collide. Yessssss! I love these things. I am all over your coconut idea. ALL OVER IT. The story about your babysitter was so great! I bet her hair is still gorgeous & she still rocks out to Pat Benetar. You don’t outgrow Pat Benetar. I think just about anything extra in the baking section could be good in there! And I’m pretty sure you’re right about Pat Benetar…. These kind of remind me of my no bake cookies! I will absolutely have to try this recipe… I’m drooling a little. I’ve never made a cookie I didn’t have to bake! Easy and yummy! YUM. Also, I heart your pantry. I’ve also pinned this and very enthusiastically urged all my Pinterest friends to check out your post/recipe!!! Try adding the coconut! I think it will add a yummy flavor and fun texture. Thanks for pinning- let me know how they turn out for you!! You really had all those chocolate/white chocolate/peanut butter chips just laying around in your pantry?? My favorite little mice (Spence and Syd) would nibble thru it all in a matter of hours if I brought those home and didn’t immediately bake something with them! My pantry always has EVERYTHING! If I make enough treats, MY favorite mouse will eat the treats and leave the basics alone in their pantry drawer…. Such a sweet story, Amber! Love your memories of Colette, and I love that you babysat for her daughter! Very full circle. Delish-looking recipe. I haven’t seen her in years. I’d love to reconnect- such a big part of my life for so long! PS Try these cookies…! Wondering how I can veganize it (no dairy). I’ll have to get my blogger friend , Somer, on this one! It will be worth it I’m sure. We had a Colette. She was — is — my cousin. Still love, love, love her. She loves to tell the story of when I ate a cockroach. One day, I’m going to prank her and pretend to eat one as an adult! She was the best. I also was a Colette myself. My kids’ pediatrician, for whom I was a regular babysitter way back when, now has his son in practice with him. So cool to get to see him all grown up! I’d love to hear if that recipe is veganizable! I hope when we have kids that we can find one solid babysitter like Colette who knows us and our kids so well. It’s special.